On September 3, 2009, St. Clair College hosted Dave Van Kesteren, MP for Chatham-Kent-Essex, to announce federal funding for the campus recreational facility. The $7.7 million contribution will offset the $9 million costs of constructing the facility, which will include a double gymnasium and running track. The project is predicted to create up to 300 jobs in the community, and furthers the goal of enhancing post-secondary education and recreational opportunities in Chatham-Kent. Despite all this good news, the MP has been placed under investigation by the Parliamentary Ethics Commissioner because he personally signed the large cheque used as a prop. Van Kesteren maintained that the cheque was prepared by the College, and was presented to him to be signed just moments before the event began. Upon hearing the controversy, Van Kesteren replied, "Not thinking, I simply signed my name at the bottom of the cheque." A local media outlet has even initiated an online poll asking how Van Kesteren should be "punished" for this oversight, and suggests it was a mistake at the very least. In hindsight, Van Kesteren certainly should not have signed his own name. That doesn't make it a mistake to have done so. Van Kesteren is simply catching some heat involving a larger ethics issue for doing something any reasonable person would have done under the circumstances. Between the time that our MP put his John Henry on a sign and the regrets that followed, allegations have surfaced nationally as other Conservative MPs were discovered to have included a prominent Conservative logo along with the signature, a development that's snagged Van Kesteren in the crossfire. 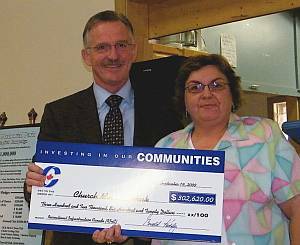 Last week, Liberal MP Wayne Easter revealed that Conservative MP Gerald Keddy had presented a giant cheque for $302,620 adorned in Tory blue, complete with the party logo. What could have been merely an overenthusiastic oversight turned into a scandal as Keddy defended his move, "I would absolutely do it again." For all intents and purposes, it appeared the money was coming from the Conservative party, instead of Canadian taxpayers. Combined with the gradual encroachment of Conservative branding onto government websites, the Liberals thought they caught wind of a strategy to misappropriate government dollars to promote partisan interests, and raised the alarm as is the duty of the Opposition. Even though he later changed his tune and apologized, Gerald Keddy's initial unrepentant defiance rubbed public sentiment the wrong way, and prompted the net to be cast wider. The Liberals later alleged some 47 instances where Conservative MPs have re-branded Government of Canada money as "Conservative" spending, and the number of questionable instances may reach 181. To be fair, many of these allegations will turn out to be innocent oversights. It was not uncommon for the Liberals to sign those giant cheques too, but they stopped short of including the "Red L" despite John Baird asserting otherwise when outed in Question Period. However, all these Conservative-branded props certainly appear to be more than a random abberation, especially given Harper's penchant for micromanaging party affairs. The best defence Conservatives could muster was, "but the Liberals did it too," which is a rather weak excuse from the party that got elected promising to do things differently in Ottawa. By pressing this issue, the Liberals may well find themselves throwing rocks in a glass house as Conservative operatives search high and low for evidence of similar Liberal cheques. Still, the standards are supposed to be higher now by Harper's own definition. So what's the Ethics Commissioner to do? Any complaints must be taken seriously. In the end, most of the complaints will be found to be nothing, but the cost will be worthwhile. It's best to nip this kind of activity in the bud and make sure each MP is clear about the rules - something Harper failed to do despite his strong rhetoric supporting government accountability when it wasn't himself in power. Of bigger concern is the underlying tactic. Harper's Conservatives have been systematically piggybacking party branding on signs, web sites, flyers, and cheques. While in most cases this doesn't actually cost the taxpayer a dime, it does create a subliminal association between the positive experience of getting some government money and the Conservative party that's in charge of the purse. This promotion indeed has some brilliant intrinsic value. From a marketing perspective, its impact cannot be underestimated. Similar product placement underwrites the costs of many movies and TV programs, so we can't pretend the effect is inconsequential even if it barely registers on the government ledger. Being able to promote partisan interests using government resources was clever until they got caught. It bears the hallmarks of being a coordinated effort directed from the PMO. Stephen Harper has never feared bending rules to the breaking point when there was partisan advantage to be had. This is where the investigation should concentrate. Our MP was doing his job. It's only right that he get some recognition for bringing home the bacon. Dave Van Kesteren doesn't deserve to be dragged through the mud for signing a cheque that benefited the community. The cheque never even appeared in a newspaper photo. There's no difference between his name being on the cheque and having his and Harper's name in the media article. We don't expect our elected representatives to remain invisible (but sometimes they end up that way). Most people know what party won the election. Nevertheless, partisan insignias have no business being associated with government publicity. For several days, video of Stephen Harper playing the piano was embedded on the official government web site promoting the economic action plan. It was removed when the Harper government had trouble justifying the video's connection to the purpose at hand, along with dozens of Harper photographs. This self-aggrandizing encroachment is what the Ethics Commissioner should investigate and censure. Leave the individual MPs alone, but find out if there were underlying orders from head office. The most important goal is to get the stimulus funding to the communities that need it, with no less than the necessary amount of oversight to make sure taxpayers get value for their investment, and to ensure that none of the money disappears into a black hole of unaccountability.